The Liverpool scene has always been a burgeoning music ground. 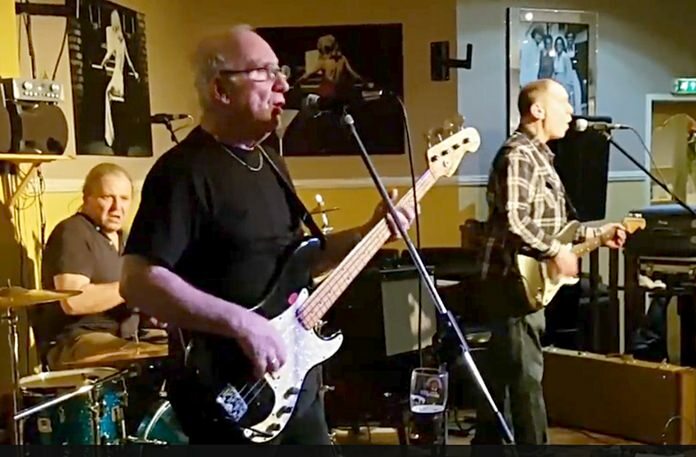 Perhaps most noticeably in the Sixties with bands such as The Beatles, The Scaffold, and The Searchers breaking though, plus solo acts such as Cilla Black, Frankie Vaughan etc., but the tradition still carries on today with the Sugarbabes recently topping the charts. In the late Seventies and early Eighties, when the music became a lot heavier, Liverpool was not to be left behind with its multitude of talent and live venues. Playing in Liverpool and all over the world were such bands as Montana, containing one Ian ‘Bam’ Bamford on lead guitar and vocals, Nutz/Rage, who released seven wonderful studio albums with Keith Mulholland on bass and backing vocals, whilst the infamous Macc Lads had Howard ‘Howie’ Minns on drums and vocals. At long last they have finally popped into the studios and laid down some of their own and the customers’ favourite covers and put them out as this amazing CD. Simply called “Set in Stone” it is a pure joy to listen to. First song up is “Dakota”, the Stereophonics song and Red Rock have taken it, given it a huge shake and put some rock into it. The results are wonderful and it’s a perfect opener to get your feet tapping. Then we get “Gimmie All Your Lovin’” with Bam giving it his best southern fried boogie. Thin Lizzy’s standard “Still In Love With You” is next in line for some Red Rock treatment and is the album’s first, but not only highlight. The track starts off in beautiful style with Bam eloquently pleading his love, following this up with some scorching guitar solos. But it is at six minutes twenty seven seconds that Red Rock pull a great trick missed by Phil Lynott and Thin Lizzy, where the band change gear and rock out the last section of the song, turning the whole thing into an epic. We are then treated to Red Rock’s interpretation of Pink Floyd’s “Wish You Were Here” and instrumentally the band then put themselves through their paces on a fine version of Jimi Hendrix’s “Red House”, plus romps through AC/DC’s “Long Way To The Top” and The Doobie Brothers’ “China Grove” with maximum Red Rock panache. To finish the album we have a complete reworking of the Talking Heads “Psycho Killer”, and stretched out to nearly eight minutes long this version really carries some venom with it. Keith’s pounding bass guitar opens the track until Bam and Howie come roaring in, the vocals are crystal clear and are spat out with genuine venom. Red Rock finish their live sets with this song and have most of the audience cowering against the back wall by the time they finish. I would forego seeing many name bands for the chance to see Red Rock again. Using all their experience and natural talent they put on a great show. Hopefully within a year they will release a second volume of their own songs. But for now this will do very nicely, and at only eight English pounds, well worth it. Note: Written By Mott The Dog and Hells Bells, who can be found at Jameson’s The Irish Pub. Soi AR, North Pattaya.